The story of the Verizon iPhone 4 is definitely an astonishing one. Leading up to nearly every iPhone release was endless speculation that a CDMA version would launch simultaneously, finally bound for the largest carrier in the US. The combination of carrier exclusivity, endless reports of AT&T's 3G failing during trade shows and conferences, pent up demand, and numerous other factors combined to create a perfect storm of rumor and mystery. Each time, analysts, insiders, and pundits alike were certain it was just months away - and then prove to be no more well informed than the rest of us. It's surreal to think that everyone finally got it right. In retrospect, it also seems fittingly ironic that Duke Nukem Forever will launch the same calendar year as the Verizon iPhone 4. The truth is that what differs between the Verizon iPhone 4 and its older brother isn't a whole lot - and that's overwhelmingly a good thing. In case you're just starting out, the main difference between the two is entirely network technology. In the USA, carriers such as Sprint, Verizon, US Cellular, MetroPCS and a number of others use 3GPP2 camp technologies for a variety of reasons. These are CDMA2000-1x, and CDMA2000-EV-DO, known colloquially as just 1x and EVDO. The story goes something like this. Europe and the majority of the planet soon after adapted GSM for 2G, then 3GPP technologies for 3G - UMTS, HSPA, and now LTE all are under the 3GPP umbrella. In the USA, AT&T and T-Mobile are the dominant carriers running network tech from the 3GPP camp. Both have GSM/EDGE 2G and UMTS 3G networks. The confusing bit in here is that CDMA is often confused with CDMA2000. On its own, CDMA refers just to the multiplexing scheme used - Code Division Multiple Access. Both CDMA2000 and UMTS use CDMA as the multi-user access scheme, the difference is primarily that UMTS allows 5 MHz channels (WCDMA) whereas CDMA2000 uses 1.25 MHz channels for data and voice. Before UMTS arrived on the scene, the distinction made a bit more sense since GSM is TDMA - Time Division Multiple Access. Apple shopped around for a carrier to bring its iPhone to, and settled on Cingular after getting the door slammed in its face by everyone else, or so the legend goes. Cingular became AT&T, Apple released a GSM/EDGE 2G phone, then three 3G phones with different levels of HSPA support, and you know the rest. It's boring to start out a review with a history lesson though, so let's stop there. 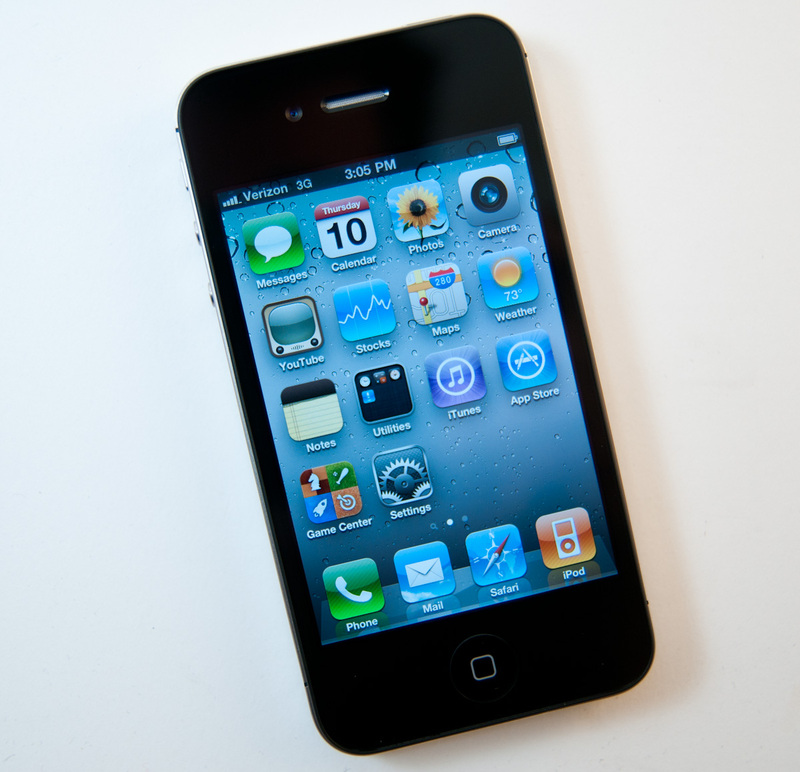 On to what's different about the CDMA version of the iPhone 4. 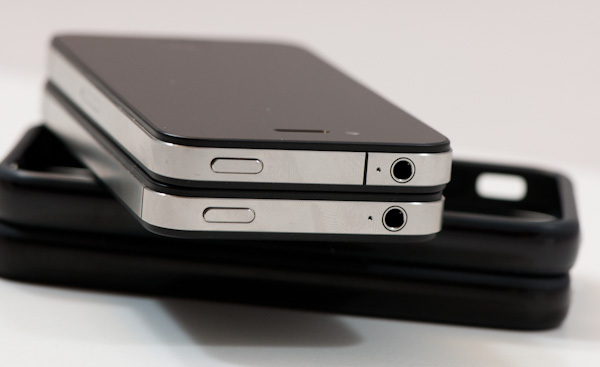 The Verizon iPhone 4 has a noticeably different outside appearance. The AT&T (GSM/UMTS) iPhone 4 is on top, the Verizon (CDMA) iPhone 4 is on the bottom in all the following photos. The black stainless steel strip at the top has moved to the far left side, displacing the vibration switch by a mm or two. The right side has a new symmetrically placed black strip as well. The two at the bottom remain the same on both sides. Obviously the other big change is the absence of a SIM slot entirely - oh and likewise there's no SIM ejector tool in the box. On the back, there's another more aesthetic difference. 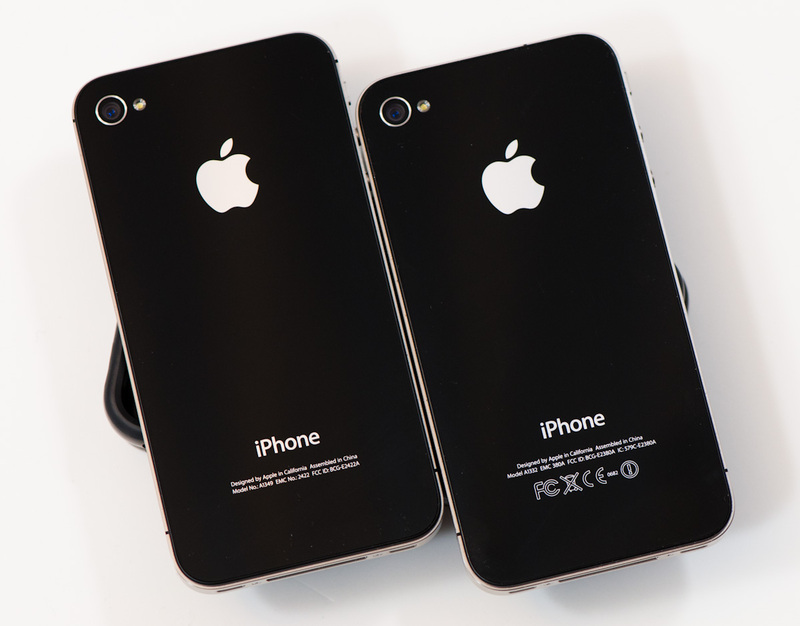 The Verizon iPhone 4 lacks the regulatory labels that adorn the AT&T version. Gone are the FCC, non-recyclable battery, and European Conformity CE markings. 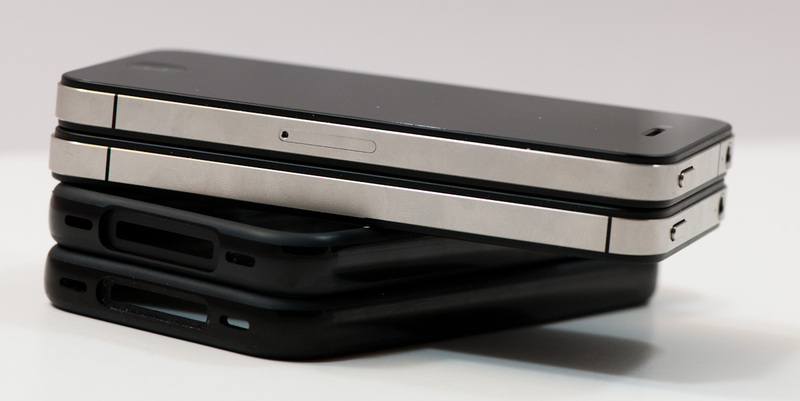 Apple seems to do something to visually distinguish each iPhone based entirely on the back. The iPhone 3GS brought chrome on the back to distinguish it from the 3G, and the CDMA iPhone 4 does away with some iconography. Fair enough. 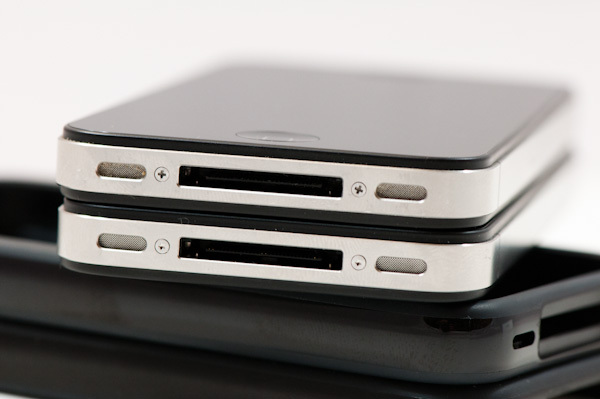 On the bottom nothing much is changed, though the Verizon iPhone 4 comes with pentalobe screws whereas our launch iPhone 4 has phillips. One of the other interesting changes is how vastly different the vibration unit is. I was a bit skeptical that the difference would be perceptible - it's actually noticeably different. The older vibrate unit feels loud and harsh, like something inside is actually rattling around. Of course, the old vibration unit is rather standard fare for phones - a counterweight on a motor. The new vibration unit occupies much more area inside, but the vibration feel is entirely different. It's almost completely silent, and makes the entire phone feel like it's moving as one complete piece. It's difficult to describe - it's a deeper and more precise vibration. I've put together a video overview of everything there is to mention about the Verizon iPhone 4, and included in there is a demonstration of how silent the new vibration unit is. Not making any noise while vibrating is both a good and bad thing depending on the context. I always leave phones on vibrate, so having them make some noise is occasionally useful. It's virtually undetectable now, so if you leave the phone on a desk and have a call come in, chances are good you'll miss it unless you can feel the vibe. On the flipside, it's a completely different experience when you're on a call and an email or SMS comes in. This is when not having the vibrate unit not make any noise is a godsend. Previously, the vibration was intense and noisy enough to make it difficult to hear the other party, and at the same time the noise was audible on the other side of the call. Now, it's silent enough to not interrupt the conversation or cause a lapse in audibility at all. That really is abysmally slow.. not fast enough to watch video at decent quality, for example. I get around 3500kbps down/1400 up in my apartment on the outskirts of town using the HTC Desire and HSDPA, faster near urban centers. This is *absolutely* true. Some signal is better than none. However, as the article mentions, this is very dependent on the individual. One person may almost never experience dropped calls on AT&T due to where and when they use their phone. 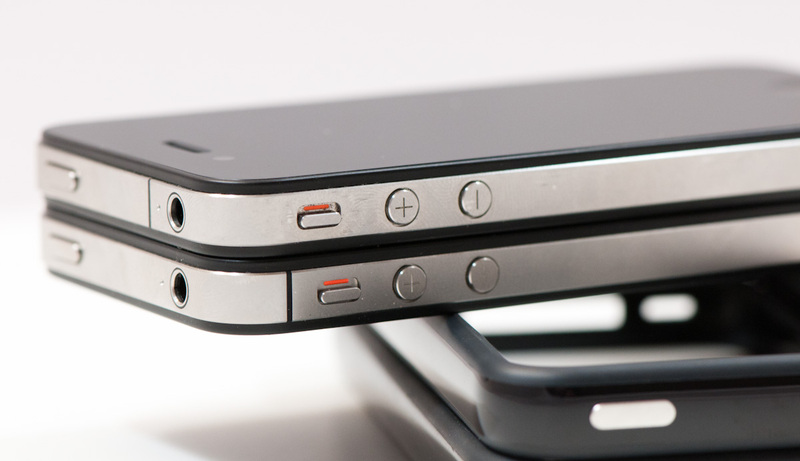 In such a situation that person may adamantly prefer the AT&T iPhone over the Verison model. Alternately, another person may use their phone -- even in the same city -- in locals and at times where the phone routinely drops calls due to AT&T's network issues. In this case that user would just as adamantly prefer Verison over AT&T. My wife's personal experience is that the parking lot of her office is a true Verizon dead zone. There is virtually no detectable signal there at all even with very sophisticated equipment and large antennas. You have to move several hundred yards from her parking lot (in almost any direction) for any Verizon phone to work. Verizon has known about this dead spot for over 8 years and has yet to negotiate a new tower in the area (or modify existing towers) to fill that hole. Therefore, for her Verizon is not an option. Oh no. These Verizon vs AT&T flame-wars are almost worse than the Microsoft vs Apple. At least in the later, you had a constant product difference. In service providers its subject to location. And in major cities, I've never had a problem with AT&T except in metros, where they didn't have antennas and Vzn decided to put some up and large venues where you got a lot of units in one tight area at the same time, like large conferences or concerts. Indeed, the component they pointed to and called the WiFi antenna is the first of two cellular feed lines, and that part has indeed not changed. It's for cellular (and was on the GSM/UMTS iPhone) and not WiFi. Even the FCC correctly labels it as being a feed line for cellular. WiFi has always been at the top in the same place with the same package, though the WiFi antenna did change slightly with the Verizon version.